The VEXpro team has been paying attention to the feedback from the community on the pros & cons of the Ri3D and Build Blitz projects, and after careful consideration we’re revamping the way we do Build Blitz for 2015. This year, our engineering team will not be building full robots over the course of three days. Starting during kickoff we’ll begin an entire WEEK LONG roll-out of educational materials, application engineering examples, prototype videos, design guides, strategy analysis and more — all targeted specifically for the 2015 game! Maximizing what we can accomplish in the three days should not be the goal; we want to make sure we keep our focus on enhancing the experience of what all of you can do in six weeks. Our goal is to provide teams with the foundation materials they need to succeed in this year’s game. We want to eliminate the frustrations associated with being an inexperienced team, without removing the challenges inherent in this incredible program. Since we don’t have any idea what the 2015 FIRST Robotics Competition game will be, our ability to plan is somewhat limited. We have a few things we know we DEFINITELY want to do. We also have a few general ideas of things we could do, depending on the game. This project isn’t about developing an elite-level robot in a week. We’re trying to provide educational resources for medium-level and inexperienced teams who are looking to seed or be a 1st round pick at Regional/District Events, and be 2nd round picks at Championship (or better). 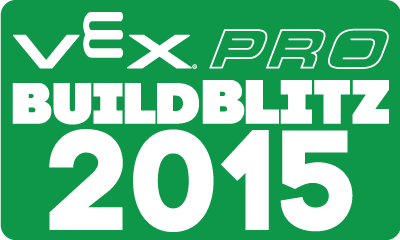 Follow us on Twitter @BuildBlitz for direct content from the VEXpro Build Blitz team members, and frequent updates throughout the week. Keep an eye on the official Build Blitz YouTube channel where we’re excited to showcase plenty of testing videos and a few interviews.